Ranveer Singh and Sara Ali Khan's Simmba continues its "thunderous" performance at the box office. The Rohit Shetty-directed film has managed to collect Rs 21.24 crore in just four days, pushing its grand total to Rs 96.35 crore, Bollywood trade analyst tweeted. Simmba is just inches away from cruising past the Rs 100 crore mark. "Simmba ends 2018 on a thunderous note. Records superb numbers on Monday (31 Dec). Will continue its victory march today (1 Jan). It's Simmba wave at the box office. Friday Rs 20.72 crore, Saturday Rs 23.33 crore, Sunday Rs 31.06 crore, Monday Rs 21.24 crore (better than Friday). Total: Rs 96.35 crore (India business)," Taran Adarsh wrote. #Simmba ends 2018 on a thunderous note... Records superb numbers on Mon [31 Dec]... Will continue its victory march today [1 Jan]... It's #Simmba wave at the BO... Fri 20.72 cr, Sat 23.33 cr, Sun 31.06 cr, Mon 21.24 cr [better than Fri]. Total: =Rs 96.35 cr. India biz. A Box Office India report stated that it is "rare" for a film to go past Rs 20 crore on Monday but Simmba has become the eighth film to do so. "The Monday number is a rare occasion when a film has gone over Rs 20 crore nett on Monday. Simmba is the eighth one to go over Rs 20 crore nett and is the second best Monday of 2018 after Sanju. The holiday is on Tuesday for the New Year and the film could go towards its Sunday figure though it could be that much of the growth is in the Monday number as was the case with Christmas Day last week when the all the releases failed to show the growth that is expected on a big holiday," the report stated. Ranveer Singh's Simmba opened to positive reviews from the critics as well as the audience. 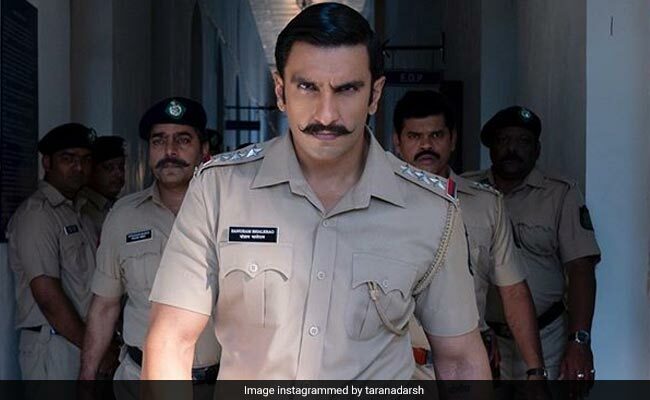 In his review for NDTV, film critic Saibal Chatterjee gave Simmba 2 stars out of 5. "The cop action saga narrated by Ajay Devgn, the star of Shetty's Singham, is about a cavalier police inspector Sangram Bhalerao aka Simmba (Ranveer Singh), whose roots lie in Shivgad, Singham's hometown. But unlike the squeaky-clean older officer, Simmba thinks nothing of resorting to corrupt ways to line his pockets," he wrote. Simmba is Sara Ali Khan second film this year, who made her Bollwyood debut with Kedarnath. Besides Sara and Ranveer, the film also stars Sonu Sood and Ashutosh Rana.